Columbia Phonograph Company, and himself a former court reporter, gave assurances to stenographers that phonographs would not endanger their jobs. "The phonograph has come much into use as an assistant in dispatching correspondence, and it is not used in lieu of, but in connection with the stenographer." 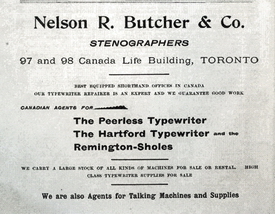 Nelson R. Butcher, official reporter for the Toronto court system, variously president of the International Association of Shorthand Writers (for Canada) and the Canadian Shorthand Society, who was certainly one of the most well-known stenographers of his time, eagerly embraced phonographs early on. And he especially liked Bettini machines. Relatively little is known about Butcher’s early life, or how and why he happened to enter the profession. He was born in Canada about 1858 and married Lilllian A. Tile in Hamilton City, on February 7, 1880. The couple had a son and daughter, the latter of whom was tragically killed in an accident at Niagara Falls in 1912. Butcher lived until April 6, 1935, and he died in York, Ontario, at the approximate age of seventy-six. 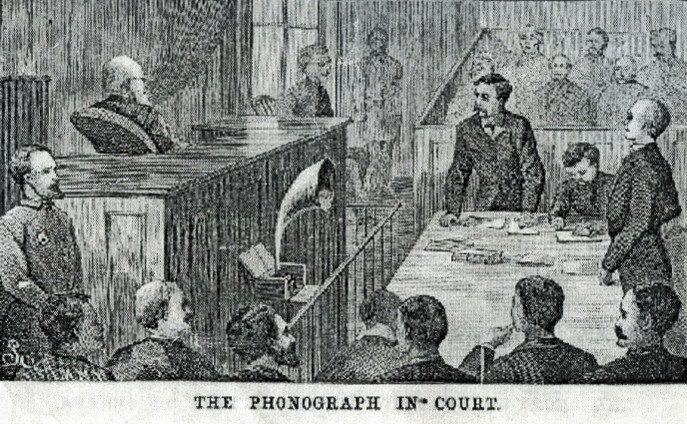 "Mr. Nelson Butcher, the official stenographer of the Gamey investigation, has 16 copies of a verbatim report of each day’s proceedings in the hands of the Court at 10 o’clock of the following day…To reproduce them in the required time, Mr. Butcher has a staff of 10 or 12 experts, with other professional operators in reserve. Mr. Butcher himself remains in court during the proceedings and takes most of the shorthand…To extend his notes he uses a Bettini instrument. 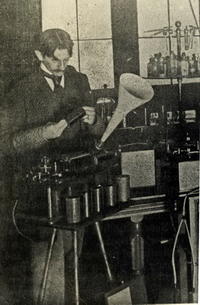 This is an electrical appliance which works on something of the same principle as the [Edison] phonograph…The Bettini attachment while Mr. Butcher is speaking into it is connected to successive rollers which reproduce his words… to two operators on typewriting machines…A few minutes after these two start working, another relay begins making copies of their sheets and in this way 16 copies are completed before midnight. 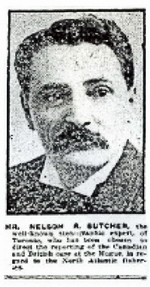 Mr. Butcher has one or two Bettini instruments and several typewriting machines in reserve, as a breakdown with such limited time to work would be disastrous…"
In all probability, Butcher obtained his Bettini gear directly from the Lieutenant’s New York City laboratory, as Nelson R. Butcher and Co. was known to be selling phonographs by 1897. Another possibility is that he obtained the Bettini machines from the music dealer, W. R. Stevens and Sons Co., also of Toronto, which is known to have sold Bettini products. In 1907, the last of the Bettini Phonograph companies, no longer owned by either Bettini, his wife, or his in-laws, went out of business. Butcher may have stopped using Bettini machines around that time.